Over the next couple of weeks, we at IDA will be introducing our community to the filmmakers whose work is represented in the DocuWeeksTM Theatrical Documentary Showcase, which runs from August 12 through September 1 in New York City and August 19 through September 8 in Los Angeles. We asked the filmmakers to share the stories behind their films--the inspirations, the challenges and obstacles, the goals and objectives, the reactions to their films so far. So, to continue this series of conversations, here are Joke Fincioen and Biagio Messina, directors/producers/executive producers of Dying to Do Letterman. 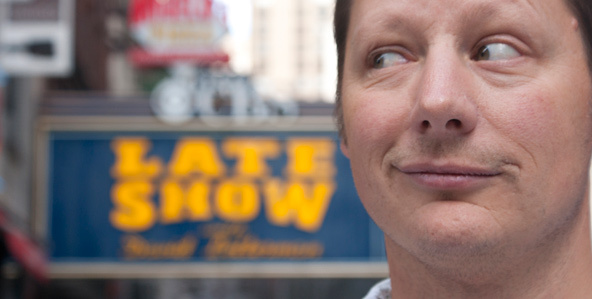 Synopsis: This award-winning documentary follows funny man Steve Mazan as he chases a larger-than-life dream: performing stand-up comedy on David Letterman's show. However, his quest becomes far more urgent when he learns he may only have five years to live. With long odds stacked against him and time ticking away, Steve faces a universal question: Should one persevere in the face of every obstacle? Or is there finally a time to give up? A funny, inspiring, emotional film that proves it's never too late to chase your dream. Joke Fincioen and Biagio Messina: The two of us had always dreamed of making movies. We met at UCLA, and quickly realized that all of our screenwriter friends were writing the same kinds of things. (At the time, every script seemed to be set in a coffee shop with characters who talked like a mash-up of Quentin Tarantino and Kevin Smith.) We wanted to go for "real" in the movies we hoped to make, and so we began in documentary as a way to get out in the "real" world and capture everyday people living their own extraordinary stories. Now it's turned into a love of every style of nonfiction storytelling. IDA: What inspired you to make Dying to do Letterman? JF: In the early 2000s, to pay our bills (well, almost pay them! ), we were editing actor's demo reels, corporate videos and video game trailers out of our one-bedroom apartment in Hollywood. Steve Mazan (subject of our doc) came in to cut his very first comedy reel--just a simple tape with some of his stand-up, and his name and contact info at the end. We kept in touch after that. A few years later--we were still living in the one-bedroom apartment--Steve sent an e-mail saying he'd launched a website called Dying to do Letterman, and he was hoping people would e-mail David Letterman and ask to see Steve perform on the show. BM: I was editing when the e-mail came in, and I remember Joke went to check out the site, and then she gasped from the other side of the room. She said, "Steve's got cancer." His new website was dedicated to his dream: performing on David Letterman's show. However, doctors told him he might only have five years to live, and he planned to "live his dream or die trying." We called Steve and asked if there was anything we could do, and he said that he'd been shooting a little footage of himself, and was thinking of making a documentary about his journey. Would we help him? We agreed to give him a camera immediately (one of two we owned), but we weren't sure about making the doc. It's a hard decision to make a documentary about a sick friend, especially if you're going to try to do it right--be there for the good and the bad--and not just make a simple valentine to a buddy whose time is short. JF: After thinking about it overnight, we told Steve, "If we do this, we want to really do it, all the way. And what that means is, if we're there, and things are going bad for you, we can't just put the camera down and give you a hug. We're going to be there filming you; we're not going to be there as friends." the tone we hoped to capture in the documentary. funny, inspirational doc about chasing big dreams, no matter what. Potential investors weren't keen on funding a documentary that could stretch on for years, may end with Steve's death, and would probably never involve an appearance by Steve on David Letterman's stage. It was a bad bet, pure and simple. That meant funding it ourselves, shooting it ourselves, editing it ourselves...It meant we had to make the movie because no one else would. And we were happy to. That's what indie film is all about: You make a movie you believe in because no one else will. You put your money where your mouth is and say, "The world needs to see this story." You ask people for a lot of favors along the way. And then you hope you don't screw the whole thing up. Add to all of that the most amazing, incredible demand anyone has ever made of us in our entire filmmaking career--Steve's only creative input before we started filming--a pledge he asked us to make to him: "Even if I die, you have to finish the movie, and make it funny." BM: There was only one thing we really knew about the movie when we started. It would have one of two endings. Either Steve makes it on Letterman, or Steve dies trying. much cancer? How much comedy? How much of his friends and family? JF: Once the filming was complete, we had a little over 300 of hours of footage--some great, some junk, some a big question mark. So we leaned on classic storytelling structure when choosing which scenes to put in the movie. clear first- and second-act turning points, etc. Because of that approach, though, we had no idea what the final movie was really going to be like until we were pretty deep in editing. There was no "script" or interviews we planned to use as tentpoles. Everything was driven by the real story we captured over the years. JF: One thing that did turn out exactly as we planned were fun "narration pods" that explain certain concepts to the audience in a fun, stylized way. These look very different from the vérité scenes, and that was important--we never wanted viewers to confuse the two. IDA: As you've screened Dying to do Letterman--whether on the festival circuit, or in screening rooms, or in living rooms--how have audiences reacted to the film? What has been most surprising or unexpected about their reactions? JF & BM: The number of standing ovations has been overwhelming, humbling and, to be honest, shocking. I don't think there's been a single screening where the audience reactions afterward haven't brought us both to tears. We've heard from many, many people who've told us that the movie has inspired them to chase their own dreams. The most unexpected reaction to the movie was a young lady from Ohio who said, "That's it! I'm taking drum lessons!" Turns out her one regret in life was never learning to play the drums. She told us she was going home, getting a drum set and starting lessons--all because of the movie. That's one of our favorite stories so far, and it makes us so happy. We think the world would be a better place if more people decided to chase their own dreams, no matter how big or small. JF & BM: When we were coming up, we were lucky to work with R.J. Cutler (The War Room, The September Issue), and he taught us to "shoot everything" and trust that a great story will emerge if you stay out of the way and just let it happen. of Work and Waiting for Superman. That's the best advice we've ever heard. Dying to do Letterman will be screening August 26 through September 1 at the IFC Center in New York City and September 2 through 8 at the Laemmle Sunset 5 in Los Angeles. For the complete DocuWeeksTM 2011 program, click here. To purchase tickets for Dying to do Letterman in New York, click here. To purchase tickets for Dying to do Letterman in Los Angeles, click here.